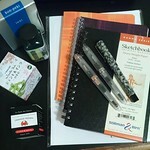 « Looking For A New Pen And Ink Playground? 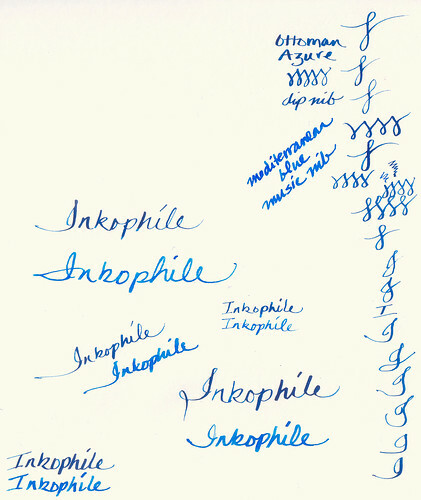 The ink I like and use most is Diamine Teal — but I wish Noodler’s made a Polar/Bulletproof ink of EXACTLY that shade: not nearly, but EXACTLY. J. H. Rouille d’Ancre with a handblown Venetian glass dip pen. It’s such a strange color I can’t help but love it, but the shading doesn’t show up well in my Safari Fine. I’m with you–Noodler’s Legal Lapis, at least for routine things like legal documents and checks. For my real (ornamental Spencerian) signature, McCaffery’s Penman’s black with a Nikko G nib in an oblique holder made by Mike Sull. So many different signature inks. Such a diverse and unique group of writers! Yes. I’m known for signing my name in Diamine Pumpkin. If its orange, they know its an original copy. What a striking color for a signature!